What are you looking for? season start, teams, news, SG world, docs, history, gyms, links, archive. 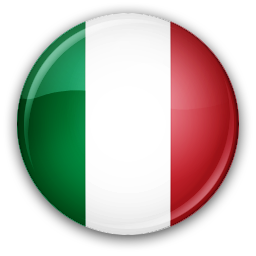 Versione in italiano: leggi questa pagina in italiano. 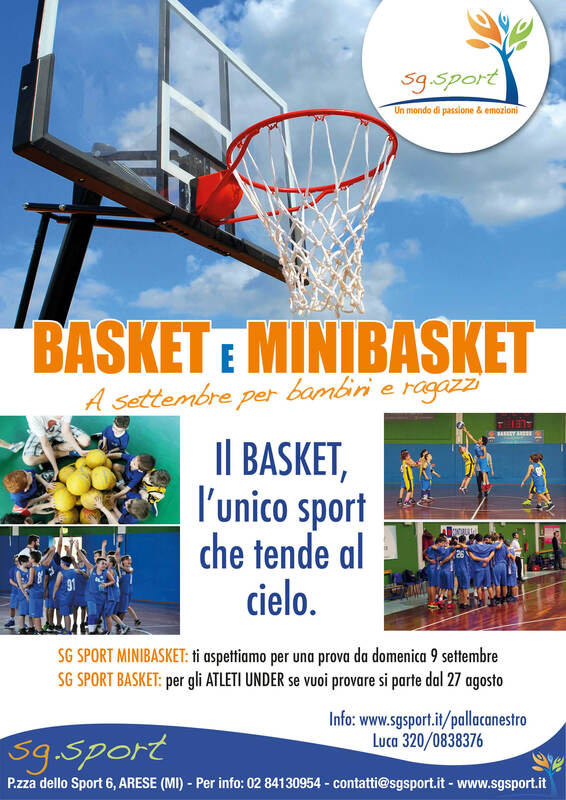 SG.Sport Arese Basket: Arese basketball and Arese mini basketball. Courses and teams of all categories, open to all, male and female, to the delight of a basket ... all supervised by our prepared federal technicians. Also for this season SG.Sport is pleased to announce the formalization of the agreement with Olimpia Milano for the youth sector. Armani Junior Program (AJP) is an important agreement for SG.Sport and for Arese. Thanks to this partnership, so rich in content as well as prestige, will allow all the young people of the territory to be able to cultivate their passion for this wonderful sport in a magnificent environment. Besides organizing events, parties, open days, you can go and watch the Serie A championship games at discounted prices. SG.Sport and Olimpia Milano ... a big boost for the Aresino basketball team. Start dates for the 2018/19 season: the official appointments of the new season 2018/2019 of all SG.Sport Arese Basketball and Mini basketball teams. Come and give it a try: flayer tryout mini basketball and basketball in Arese. Before tryout, provide the disclaimer and the appropriate medical certificate. Registration: to formalize the registration you need to make the payment (in the secretariat or by bank wire transfer: SG.Sport IBAN), view the SG.Sport regulations and sign the form "rules, authorizations and regulations". Teams and year of birth - season 2018/2019: the categories of this season with indication of the type of medical certificate requested (it is possible to book a non-competitive medical examination at the Cici for the issue of the certificate of GOOD HEALTH with ECG The visit will then be made directly to the Cici in the infirmary). Coaches, companion, staff: the coaches of Basketball Arese, the instructors of Mini basketball Arese, the companions and the staff (contacts). Weekly program: updated program of each week (complete or divided by each team). Synoptic training schedule (from monday to saturday) and time training teams (separate, of each team): standard weekly timetable. Physical training (Under and Senior): day and time individual training next to the gym. The holiday days of the Arese mini basketball course, which follows (in general) the school calendar. Senior: 1st Division FIP calendar (round"Milan 3") SG.Sport Arese Basketball. Review of newspaper articles in printed media and on online information sites. Facebook page SG.Sport Arese BASKET: the latest news, photos and competitions. Video SG.Sport Arese BASKET: some videos of the Basket and Minibasket sector..
PalaCICI: the measures of the parquet basketball court. Seating: 240 people. Materiale tecnico SG.Sport Arese Basket: divise, borse, t-shirt, felpe, giubbotto. Procedura per la prenotazione degli articoli "merchandising SG". Accident procedure: what to do in case of an accident. Positive cheering: the decalogue of the fan and the poster of the summit athlete. Come and give it a try: liability discharge form. Pagamento quota iscrizione tramite bonifico bancario: IBAN di SG.Sport. Privacy, GDPR e altro: modulo "norme, autorizzazioni e regolamento". Minibasket: guidelines for changing rooms and training sessions. Nota fisco e detrazione spese sportive figli: la detrazione d'imposta (dovrebbe essere del 19%) nella presentazione del modello 730 spetta per una spesa massima di 210 € per ciascun ragazzo (circa 40 €). E' possibile richiedere la ricevuta fiscale in segreteria Cici oppure a Luca. 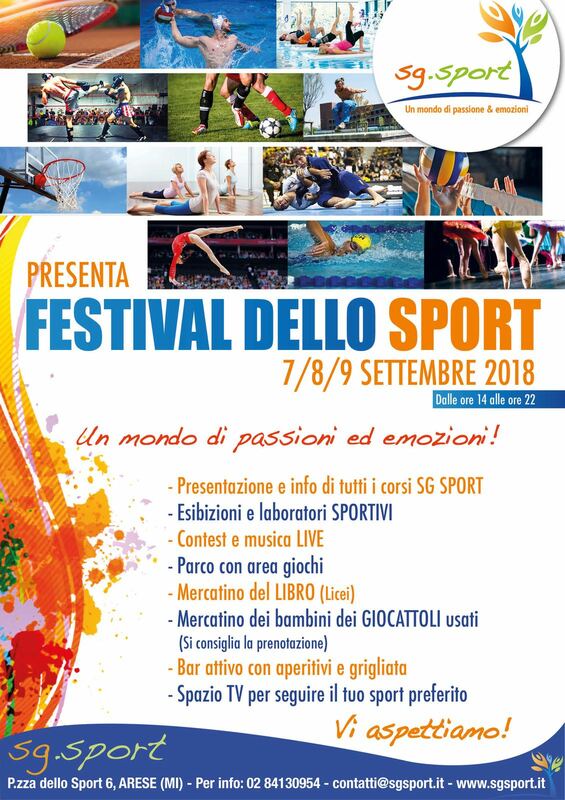 Bando dote sport 2018 - Regione Lombardia: fino al 31 ottobre 2018 è possibile presentare la domanda per la Dote Sport, un contributo per sostenere i costi di attività sportive dei minori (6 e 17 anni compiuti o da compiere entro il 31/12/2018). l'informativa FIP sulla privacy, in riferimento al modulo FIP da firmare per il tesseramento. Which medical certificate and who to deliver it: type of medical certificate required. Guidelines for the non-competitive medical certificate: minibasket athletes of the Pulcini teams last year (1st grade), team Scoiattoli and team Aquilotti. It is possible to make the non-competitive medical certificate directly to the Cici (local infirmary) by reservation in the CICI secretary at a cost of € 39: the leaflet issued by the doctor "Take Care" it is to be delivered to the Cici secretariat. Request form of medical-sporting visit for the suitability of the AGONISTICA practice to be requested from the manager or in the secretariat. Excluding the first visit, in the following, the competitive medical certificate can not be renewed under a special arrangement before 30 days. from the expiry of the previous certificate. The form must be stamped and signed in original. It has annual validity: if it was made on October 15, 2018, the certificate will expire on October 14, 2019. The history of basketball at Arese: the first senior team in the various seasons. The CICI: the "Davide Ancilotto" Municipal Sports Center in Arese is named in memory of a great basketball player. The historical journal "Let's Go!" and some historical newspaper articles (late 80s). PalaCICI, palazzetto di basket presso Cici.Sport: via dello Sport, 6, Arese (2° ingresso in viale Monte Resegone, 67, Arese). Palestra LICEO "Falcone e Borsellino": ingresso in via dei Gelsi, 4, Arese. Palestra Col di Lana elementari: ingresso in via Col di Lana, 15, Arese (scuola primaria “G. Pascoli”). L'ingresso da viale Monte Resegone, 8 non si può utilizzare perchè è un'uscita di emergenza antincendio. Palestra Matteotti elementari: ingresso in via dei Gelsi, 1, Arese (scuola primaria “Don Gnocchi”). Palestra Valera medie: ingresso in via Varzi, 13, Arese (scuola secondaria “Leonardo Da Vinci”). ARCHIVE SEASONS: archive seasons 2017/2018, archive season 2016/2017, archive season 2015/2016.